Exercise will help you lose weight and reduce body fat. However, you may find certain exercises challenging if you're obese. Obese people carry extra weight around their midsections -- this makes certain movements impossible or uncomfortable. For instance, you may find weight benches and machines too small to get into or sit on comfortably. Luckily, you can take advantage of other exercise options. 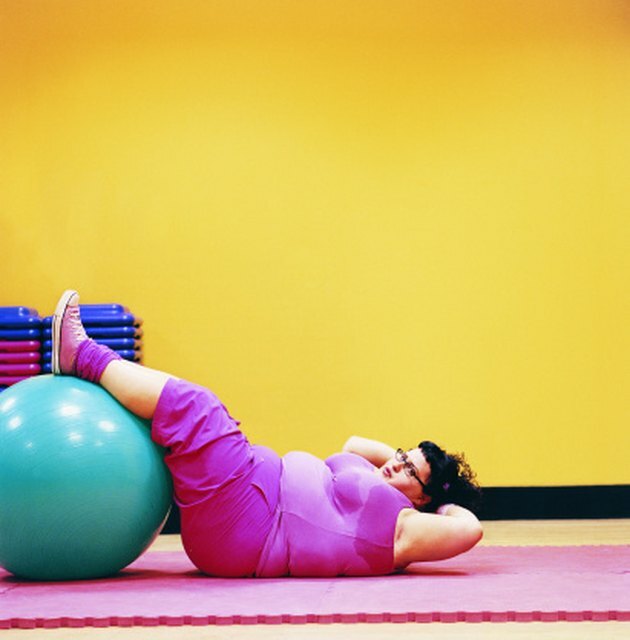 Use an exercise ball for abdominal crunches, situps and resistance training. This piece of equipment will help you perform certain abdominal exercises you may not be able to do on an ab machine. Buy an exercise ball you can use at home if you're uncomfortable going to a gym. Select a burst-resistant exercise ball -- certain models can support as much as 2,250 lb. Perform cardiovascular exercise to burn calories and improve the health of your heart. Water aerobics increase your heart rate as you expend energy. The water will make you feel lighter, help support your body weight and lessen the impact on your joints; it also allows you to move painlessly through your workout while providing resistance. Gyms that provide pools often offer classes that focus on water aerobics. Swim laps at home if you have access to a pool. Walk. This may sound simple, but it's the No. 1 exercise recommended by the American Heart Association, the Centers for Disease Control and Prevention, the Mayo Clinic and the National Institutes of Health. Walking provides a low-impact aerobic activity you can do anywhere. If you're morbidly obese, you may have trouble walking; if so, start with water aerobics and gradually add walking to your routine as your stamina improves. Obese people who walk slowly burn more calories per mile while reducing the risk of arthritis and joint injury, according to a 2005 study at University of Colorado at Boulder. Since obese people carry extra body weight, they burn more calories walking -- this results in lost pounds and inches. You don't need special clothing or equipment to walk. You don't even have to go outside. Simply walking up and down stairs counts as an aerobic activity. If you're obese -- especially morbidly obese -- you may struggle to perform such daily activities as getting up from a chair or out of a car seat. Simply stepping up and down curbs may pose a challenge if you carry excess pounds. Perform functional exercises, which use your body weight as resistance, for general conditioning. For example, practice sitting down in a chair and standing up, or sittercise. Step up and down a curb or a step on your porch; this uses stabilizer muscles while improving your balance. Functional exercise burns calories while strengthening the muscles involved in the motions.